Minimal assembly required. Deep Dovetailed Drawers. Under-mount soft-close drawer slides. Concealed soft-close door hinges. Plenty of storage and counter space. Variations in our natural stone products ensure that your vanity will be truly unique. 2-Year Limited Warranty. Highlight the contemporary look of your home, with this transitional single bathroom vanity. Two doors conceal shelves that offer ample storage space for small or large items. The doors and sides are surrounded by a raised trim. Bring a classic ambience into your bathroom with the upscale Ashburn 60 inch W vanity paired with the 61 inch Tempest Black marble top with dual undermount sinks. The white finish is clean and sleek, offering a vanity that is more affordable than it first appears. Vanity includes four cabinet doors and 3 centre drawers with soft-stop bumpers the provide plenty of storage space withinch Check out the rest of the Ashburn collection for matching items like wall cabinets and mirrors. An ideal complement to your contemporary decor, the 48-inch Malibu wood bathroom vanity features clean edges and a sophisticated aesthetic. The rich espresso-finished cabinet, made of solid oak, lends a warm feeling to your bathroom as it contrasts beautifully with the Carrara white marble top. Its design is complete with sleek and simple brushed nickel hardware and European soft-closing sliders and doors. Water Creations collection of premier bathroom vanities will add a level of sophistication and class to any bathroom's decor. The crossroads of timeless design and innovative modern manufacturing processes merge harmoniously to ensure each vanity's finish. Faucet not included. Daria 60 inch Single Vanity in White, White Carrara Marble Top, Square Sink, No Mirror The beautiful Daria collection vanities stand out in any bathroom with strong, clean lines, raised panels and elegant counters with square sinks. There's plenty of cabinet space, the fully extending drawers are dovetail construction, and chrome detailing completes the look. Daria vanities deftly combine the function of today with a nod to the elegance of the past. It's the new modern classic styling with a contemporary twist. 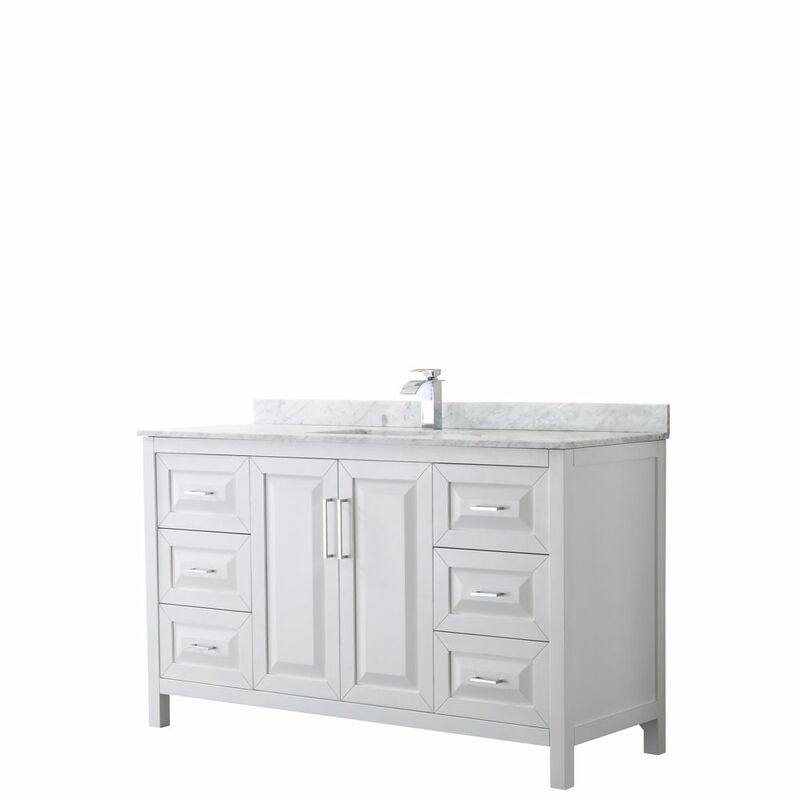 Daria 60 inch Single Vanity in White, White Carrara Marble Top, Square Sink, No Mirror is rated 5.0 out of 5 by 3. Rated 5 out of 5 by Nicholas from Absolutely beautiful unit at the perfect height. ... Absolutely beautiful unit at the perfect height. Rated 5 out of 5 by Brian from Very well built. Easy assembly. Because of the weight, you... Very well built. Easy assembly. Because of the weight, you need two strong people to pick it up. Looks great. Rated 5 out of 5 by Kate from Beautiful vanity and countertop! Made very well. Soft close... Beautiful vanity and countertop! Made very well. Soft close drawers are very nice. No complaints!